The Denver Area Council serves over 55,521 youth in Colorado and has over 10,000 adult volunteers. Scouting’s programs and outdoor adventures challenge young people to excel while building their character and preparing them for a lifetime of opportunities and leadership. Scouting is continually updating its programs to meet the needs of today’s kids—from the introduction of a new healthy-living initiative, to an increased emphasis on science, technology, engineering, and math in their existing programs. The BSA will also continue to stay focused on the fundamental values of Scouting—things like character, leadership and service. For more info, click here. Billups is a former point guard who played 17 seasons in the NBA. A star at the University of Colorado, he was chosen third overall in the 1997 NBA draft by the Boston Celtics. A five-time NBA All-Star and a three-time All-NBA selection, Billups played for the Celtics, Toronto Raptors, Denver Nuggets, Minnesota Timberwolves, Detroit Pistons, New York Knicks, Los Angeles Clippers and Team USA. He won the NBA Finals MVP in 2004 after helping the Pistons beat the Los Angeles Lakers in the Finals. 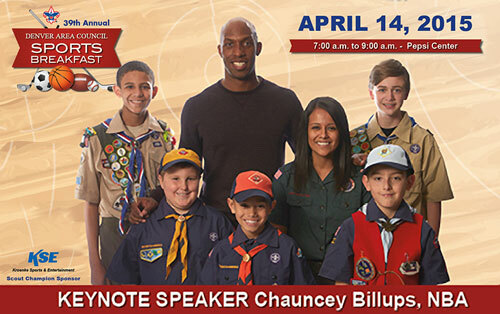 If you would like to book basketball speakers or professional athletes like Chauncey Billups for a speaking engagement, autograph signing, product endorsement, fundraiser or special event, contact Chauncey Billups’s booking agent for appearance and speaker fees at Sports Speakers 360. For booking agent and appearance fee information on how to hire Denver Nuggets players for appearances, call 1.855.303.5450.